Password Remover for Excel (Excel Password Unlocker) uses advanced algorithm methods to recover protection passwords on all Excel file formats for access and password removal. Password Remover for Excel is fast and efficiently finds protection passwords on locked workbooks and sheets to enable access and to the Excel file data. 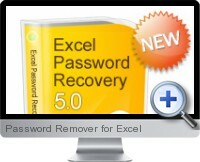 Recovers passwords for Excel documents of all versions 97/2000/XP/2003/2007/2010. Multiple modes including brute force attack, brute force with mask attack, and smart dictionary attack. Simple and intuitive interface and fast execution.